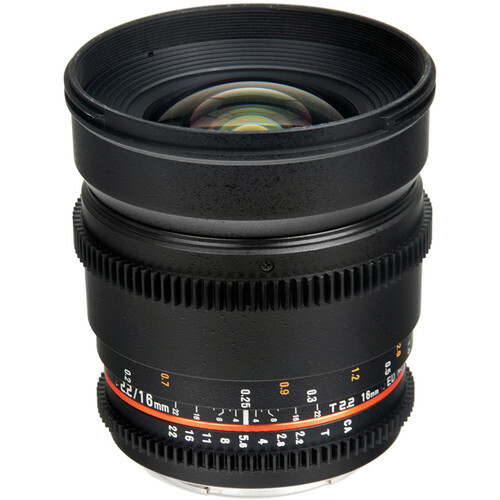 The Bower 16mm T2.2 Cine Lens for Nikon F is a wide-angle lens optimized for digital cinematography. The lens produces an image circle that will cover APS-C sized sensors or smaller. The focus and aperture rings feature industry-standard 0.8 pitch gearing for attaching a follow focus unit. The aperture ring is also de-clicked to allow for smooth iris pulls while shooting. Focus, aperture, and depth of field markings are on the side of the lens to aid focus pullers, who typically operate on the side of the camera. With an angle of view of 83.1°, the lens is well-suited for shooting landscapes, architecture, and for use in tight interior locations. A maximum aperture of T2.2 means that the lens is effective in low-light shooting and can produce a shallow depth of field when the lens is closer to the subject. The lens has a minimum focus distance of 7.87". A bayonet-mount lens hood and lens pouch come included with the lens. Box Dimensions (LxWxH) 8.9 x 6.7 x 3.3"
16mm T2.2 Cine Lens for Nikon F Mount is rated 4.8 out of 5 by 8. Rated 4 out of 5 by Matthew W. from Great lens, needs more focus marks. Optically this is an excellent lens with quality comparable to my older Nikon primes. It is also very fast at T2.2 and works great in low light. I know of no other 16mm lens for under $ that can match its speed or performance. It only comes up short in one area, focus distance marks. There is only about 3/4 inch of rotation distance between 2 feet and infinity and no focus marks. For a cine lens designed for video production this makes no sense. Focus pullers need as many focus marks as possible between 2' and infinity to accurately pull focus. I'm not sure why this is since the 14mm version of this lens has over 2 inches of rotation distance between 2' and infinity and has marks for 3', 7' and 10'. The 16mm Rokinon and 16mm Samyang are essentially the same lens and have the same problem with distance marks. I ended up sticking a white sticker to the focus ring and adding some extra marks. I'm happy to report that the 2' mark is accurate and otherwise I'm very happy with the lens. It works very well with my GH4 and Arri SR matte box and performs superbly on low light. It is a great bargain at the price. Rated 4 out of 5 by Jeremy S. from Quite good Using this lens with the BMPC4K. Focus has a nice long rotation, no-click aperture is super but honestly unnecessary most of the time unless you're run and gunning in and out of buildings and so forth. The price is fair to good for a lens of this quality IMO, and considering the options. So far I find it to be adequately sharp, it compares nicely with my set of manual Nikon primes. I haven't worked with cine-quality lens, (Zeiss, Cooke, etc) but at the near-cine-quality level this lens hangs in nicely. It is a lot of plastic and I can feel/hear the barrels touching sometimes when I focus, so I know this lens will not last as long as a heavier piece, but it's going to be fine for a couple years I'm sure. Just take extra care not to get it dusty and it should be fine. Rated 5 out of 5 by Jleeder77 from So far so great! Have only used this lens a couple of times, but I anticipate it will be my new favorite for a wide angle. The extra weight provided an unexpected benefit in that my glidecam footage was far more stable! The below video was shot exclusively with this lens. Rated 5 out of 5 by Jleeder77 from First Cine Lens for me, so far so good! This is my first cine lens and for the price seems to be a great deal. It has been so nice not to have to deal with the autofocus and lens motor noise over my video's audio. The lens is a little heavier than I thought it would be, which has been a great help to my glide cam's stability. Quality seems fantastic, rings work very smoothly and the aperture control is very good. Rated 5 out of 5 by ROLENSKY from Great lens Great lens, I'm still new to film making and enjoyed this lens. Aperture and focus rings are sooo smooth. And I can be very precise. Love this lens so far, can't wait to make full use of it. Will this lense fit a d5200? Yes it will. This lens is compatible with the Nikon D5200. Will this work with a Nikon D7200? Is this a good lens for video as well as still photography? Or is it mostly for video? How about on portraits? Does it work with auto focus on the Nikon D7200? Do I have to use manual mode on the camera settings to use this lens?Also, the information indicates it is a wide angle lens. Will this lens cause any distortion in still photos (and video).Can it be used for macro photography?I haven't shot any video yet, but would like to give it a try. But I definitely want to know if this will work well for still photography. Thanks for any input you can provide! The Bower 16mm T2.2 Cine Lens for Nikon F Mount can be used equally well for video or stills.Normally you shoot portraits at 50-85-100mm. So 16mm is rather wide and is not going to be flattering in a close up. However, a mid size portrait with this could be just right in the right situation.This is an all manual lens, both focus and aperture. There is some barrel distortion thus some bending of lines. However, that is in keeping with other extreme wide angle lenses. If focuses pretty close, 7.9 / 20 cm. However that is not macro. Will this lens work for nikon d3300 and if it does will I need to buy some sort of adapter ? Will work with no adapter.However, it doesn't have any CPU. So you will not have any lens information in your file.I am don't think you will be able to use aperture priority mode either. No problem at all. Keep in mind that it is manual focus and only usable in full manual exposure mode or aperture priority. Since it is a cine lens you will anyway want to use it in manual mode.